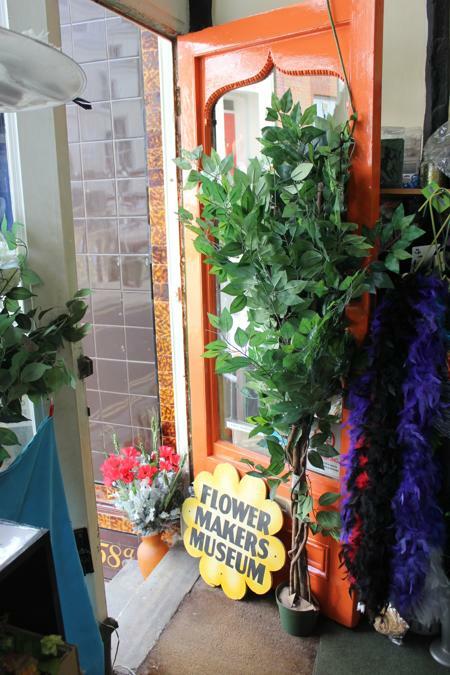 The Flower Makers Museum is situated in a high street shop in Hastings old town (the building dates back to the 14th c.). At first sight it appears to be a shop selling artificial flowers, but there is a museum in the basement. The museum opened around 1991 and consists of a large part of the inventory stock of the Shirley Leaf and Petal Company: thousands of cutting tools and flower irons; presses for ‘veining’ fabric leaves; and a large array of samples, products and ephemera concerning the business. The company manufactured silk flowers and leaves for shop displays, bridal dress decoration, confectionary, Christmas crackers and remembrance poppies. It was established in East London in the 19th century and moved to Hastings in 1910, where hundreds of homeworkers used hand tools to cut, press and make the flowers. The present owner, Brenda Wilson, bought the company in 1981 and moved the machinery and stock from an ex Mission hall to the present location. The business is still going and this is a working collection – the tools, samples and bales of fabric are used, and old presses on display have been converted to electrical power. Presently the company makes fireproof, artificial flowers and foliage for film sets, theatres and fashion designers. Inside there is a shop counter and a room crowded with artificial flowers and decorative items for sale. Behind the counter there is a back room with a desk, work bench and Edwardian iron press, which is not strictly open to the public. Stairs, crowded with displays and stock, lead down to two rooms, one with a large press behind glass and a huge array of thousands of cutting tools on shelves; the other is loosely organised into sections – one area looks like an old factory office c1910, with ledgers and historic health and safety notices. Another is devoted to clothes and things that were decorated with the flowers. No space is wasted – high and low are bales of silk and other fabric, boxes of supplies and the visitor is free to handle whatever they wish that is in reach. The feeling is part stock room, part workshop, part museum. Visitors are free to browse unaccompanied. Small capitalised typed labels are helpfully attached sporadically to explain an item or raise a question to make people look a little harder ‘how many species of leaves can you identify?’ Small cardboard mounted displays can be leafed through and contain samples, ephemera and correspondence relating to noteworthy jobs for such things as film or theatre sets. Afterwards Brenda is very approachable and invites visitors to rummage through whatever they like. She clearly enjoys answering questions about the collection. Her display approach to getting as much as possible into a small space was nicely summed up in the interview when she said: ‘I’m very good if you’re packing a car’. ← How big is that museum?